Card recognizes that Speaker for the Dead is a sequel, but wants his audiences to know that it didn’t begin that way, nor does it need to be read that way. Ender’s Game is the first novel of Card’s famous sci-fi series, but Speaker is the real meat of the impressive quartet. These first two books introduce us to the world of Ender, his boy- and manhood, and many more novels have been written to flesh out this universe. But Speaker is one of the best books that I have ever read, a true stand-out space odyssey epic that I’d read any mediocre book in order to experience. In Ender’s Game we meet young Andrew “Ender” Wiggin, an oddity in that he’s a Third child, a genius at the age of six. Earth in Ender’s time is still reeling from a war with the Buggers, preparing for another battle, and recruiting children to guard the world against impending invasion. Speaker for the Dead finds Ender dealing with a second alien species, the Piggies, attempting to bring these creatures into the fold of modern existence without erasing their unique attributes. Ender, as a figure, represents both terrible evil & ultimate good, traveling the universe is search of a legacy that he can be proud of. 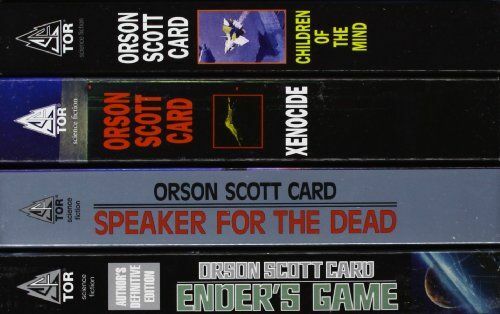 Card wrote Ender only as a way to introduce readers to Speaker, to prepare them for the complicated themes of a deep, philosophical sci-fi adventure. Therefor, the first book in this series isn’t incredibly strong in its own, but rather acts as a bridge to something much better. The “sequel” is where Card’s talent is on display, where he creates an entire world and dares us to imagine how we would run it. Speaker is an excellent early sci-fi read, channeling Le Guin, Asimov, & Clarke with every chapter. It’s worth reading the first in order to get to the second, and even thinking of them as one story won’t hurt. And ignore the movie version; it’s no good. Stick to this quartet of books; the second pair I’m hoping will be as strong as the first, and perhaps eventually I’ll read the rest of the long series of stories. Just make sure, if you’re a genre fan, you check out Speaker for the Dead; you won’t leave disappointed.